This Bride's '218 Reasons Why I Love You' Book Is The Sweetest Gift A Groom Could Ask For! When love is strong, it conquers all. So, if you thought a cross-culture wedding comes with a whole set of issues then this real-life couple will tell you how it doesn't. Weddings are not just a celebration of love but also a celebration of the uniqueness of two different cultures and families. 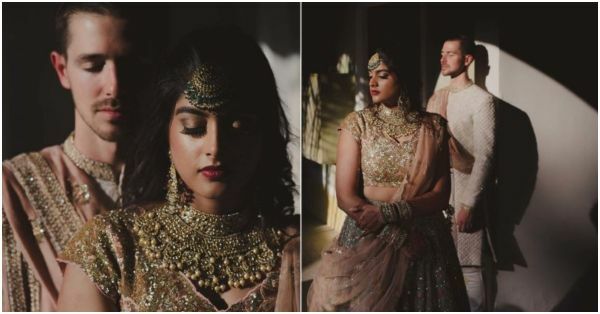 Ashna and Brett had a beautiful wedding at the Taj Falaknuma Palace in Hyderabad that represented the best of both cultures. We stumbled upon these pictures on the website of our favourite wedding photographer, Naman Verma. The couple had a Hindu ceremony in colour coordinated outfits. The bride wore an ivory raw silk lehenga teamed with a rose pink organza dupatta and a sequined blouse by Shyamal and Bhumika. The groom also wore a pristine ivory bandhgala by Shyamal and Bhumika and paired it with a rose pink saafa. Not only this, the bridesmaids and groomsmen were also in matching lehengas and kurtas for the couple's D-Day. For her haldi, the bride wore her grandmother's 150-year old wedding saree while the groom looked in sync with her in a light green kurta. The wedding was a perfect melange of both the cultures. They had the pheras but also read wedding vows to each other. The couple had a beautiful and romantic first dance and also father-daughter and mother-son dances. Both the families and close friends of the couple gave speeches after the wedding. The wedding had a lot of personal touches like customised gifts and welcome notes for the guests. On the sangeet night, the groom and almost all of the 150 guests who had been to Hyderabad for the first time danced on Bollywood numbers. To top it all, the bride presented a hand-made book on "218 Reasons Why I Love You" to the groom on the wedding day. 218 is the number of weeks since the couple met for the first time. Isn't that cute? It was love at first sight for this adorable couple who met in San Francisco through common friends. Brett asked Ashna to marry him in a fairytale proposal at Japan's Miyajima Island in 2017. A rollercoaster of love and emotions, the wedding was a perfect example of what happens when two people who are so much in love with each other decide to spend the rest of their lives together.